If you're like us, wanting your kit to look like new, especially "in front of a client", then you will certainly not be disappointed. Just as you wouldn't want to turn up at a shoot in a battered car, you'd be likewise taking a risk if you turn up with a battered up old tripod. Take a look and see what you think, and remember that Vinten (Vitec) is the leading company world-wide for professional camera support systems because most broadcast companies and producers specify them because of their rugged resistant long life. THIS LISTING DOES NOT INCLUDE A TRIPOD - NO TRIPOD. 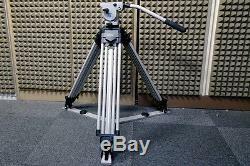 See our other listings for tripods. Apart from looking like new, the thing we like most about this head is that you can use any camera from the weight of a DSLR 35mm camera to a fully accessorised full-size broadcast camera and the second thing we liked most is it's weight, a mere 5.7 lbs / 2.6 Kg. It will handle cameras/camcorders weighing between 1Kg - 10 Kg - there is no other head in the world that offers that kind of flexibility and Vinten achieved it by allowing you to easily change the tensioning spring yourself for one that suits the load you're using - no screwdriver required. We shall supply the head with one of the following springs. NOTE: WE MAY SELL SPRINGS SEPARATELY. PLEASE CHOOSE WHICH SPRING BEST SUITS YOUR PURPOSE FROM THE LIST BELOW No. 1 SILVER Spring U005-161 MAX. / 1KG - AVAILABLE TO ORDER No. 2 GREY Spring U005-162 MINIMUM LOAD 2.2 Lbs. / 1.0KG - MAX. / 2KG - IN STOCK! 3 ORANGE Spring U005-163 MINIMUM LOAD 4.4 Lbs. / 2.0KG - MAX. / 2.9 KG - IN STOCK! 4 BROWN Spring U005-164 MINIMUM LOAD 6.5 Lbs. / 2.9 KG - MAX. / 4 KG - IN STOCK! 5 GREEN Spring U005-165 MINIMUM LOAD 8.8 Lbs. / 4.0 KG - MAX. / 5KG - IN STOCK! 6 BLUE Spring U005-166 - MINIMUM LOAD 6.6 Lbs. / 7KG - IN STOCK! 8 RED Spring U005-168 MINIMUM LOAD 11.0 Lbs. / 6.1 KG - IN STOCK! 9 BLACK Spring U005-169 MINIMUM LOAD 13.5 Lbs. / 6.1 KG - MAX. / 8.6 KG - MAY BE AVAILABLE (ASK FIRST) No. 10 YELLOW Spring U005-170 MINIMUM LOAD 19.0 Lbs. / 8.6 KG - MAX. / 10KG - IN STOCK1. If you require a spring we don't have in stock then we can order it for you. 7 - 10 days before you receive your spring separately if it's not in stock. IMPORTANT: Please state which spring you require in a message when you go to the checkout to pay for this head. The Vision 3 is the smallest and lightest pan & tilt head in the Vision range. 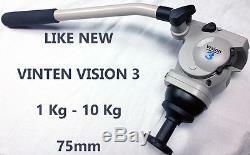 Designed for the new digital age of smaller, lighter video cameras, the Vision 3, weighing only 5.0 lb 2.27 Kg. Without the pan bar, incorporates many key features you would usually only expect to see in larger, more expensive heads. The Vision 3 comes with an illuminated levelling bubble for quick and easy set-up, calibrated drag controls using Vinten's Lubricate Friction (LF) system, plus a full ±90° of smooth tilt movement. To provide balance over a range of payloads from 2.2 lb to 22 lb, the Vision 3 incorporates a unique and easily interchangeable spring. Perfect Balance with Interchangeable Springs The Vision 3 pan & tilt head achieves the Perfect Counter Balance by means of an innovative and unique interchangeable spring balance mechanism, allowing the use of a variety of camcorders with different payloads. 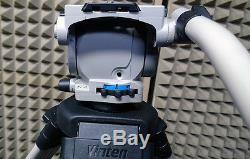 This allows the heads to tilt through the full range of ±90° in perfect balance. Eliminating a considerable amount of physical effort required by the operator to control the tilting action. LF (Lubricated Friction) Drag Control To provide the right amount of resistance, the Vision 3 uses the field proven Vinten LF (Lubricated Friction) damping system. Featuring a progressive, friction free drag, where the torque is provided from a sliding contact between dissimilar surfaces. The variable drag is adjusted to provide a non-linear torque speed characteristic, which allows "whip pan" movements. Quick Setup The unique design features allow fast setup - a must if you are continuously on the move. The levelling bowl has a double threaded screw shank, which allows the bowl lock to be tightened and released quickly. Very handy when you are constantly adjusting the bowl to level the camera (especially on uneven terrain). Tough die-cast body ensures robustness, while quality design and construction provide a lifetime of precision. Adjustable camera mounting plate with unique rubber grip strips holds the camera rock steady. Built-in illuminated bubble for horizontal levelling, ensuring easy levelling even under unfavourable lighting conditions. Maximum load capacity depending on counterbalance spring (one included): 2.2 to 22.0 lbs. / 1 - 10 Kg. SPECIFICATIONS Load Capacity 2.2 lbs to 22.0 lbs (1Kg - 10 Kg) Diameter/Thread 75mm 3" Half Ball Counter Balance System Interchangeable Springs Counter Balance Range 2.2 lbs to 22.0 lbs (1Kg - 10 Kg) Centre of Gravity 5" (12 cm) Typical Quick Release/Wedge Plate Yes Balance Plate 2-Way 4" Sliding Range, with 3/8" Screw and VHS Adapter Pin Tilt Drag Infinitely Variable, 0 to 9 Tilt Range ±90° Tilt Lock Flick On/Off Locks Spring Loaded Counter Balance Infinitely Variable, 0 to 9 Pan Range 360° Pan Lock Flick On/Off Locks Levelling Bubble / Illuminated Yes / Illuminated Temperature Range -20° to +115° F (-20° to +50° C) Weight 5.7 lb. The user manual can be downloaded HERE. DOWNLOAD THE USER MANUAL HERE. The video above explains Vinten's superior LF drag technology and why you should have it. Quick Release / Wedge Plate. 2.2 to 22.0 lb. 2.2 to 22 lb. 2-Way 4" Sliding Range, with 3/8" Screw and VHS Adapter Pin. Infinitely Variable, 0 to 9. 20 to + 115 F (-20 to +50 C). 9.9 to 22 lb. 15.4 to 44.1 lb. 40° to +140°F (-40° to +60°C). Dual 100mm / 150mm Ball. 22.0 to 72.8 lb. 2-Way 4" Sliding Range, with 2x 1/8" Screw. 18.0 to 77.2 lb. Wedge Adapter with 13 Platform Adjustment. 3448-3H 3458-3H (High Center of Gravity). 3354-5H 3554-3H (High Center of Gravity). Up to 178.6 lb. With Digital Balance Readout and Backlit Drag Knobs. With Rear control pan and tilt brake. With Integral soft-grip carrying handle, Auto-locking wedge adaptor and Rear control pan and tilt brake. With Digital Balance Readout, Backlit Drag Knobs, Long Slide Plate and Additional HD Mounting Points. NO VAT - NO MORE TO PAY. 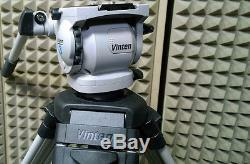 See our other items of broadcast television and film equipment by clicking. The item "Vinten Vision 3 Tripod Head 3543-3 + Plate + Pan Bar / 75mm Bowl 1-10 Kg Load" is in sale since Tuesday, July 31, 2018.